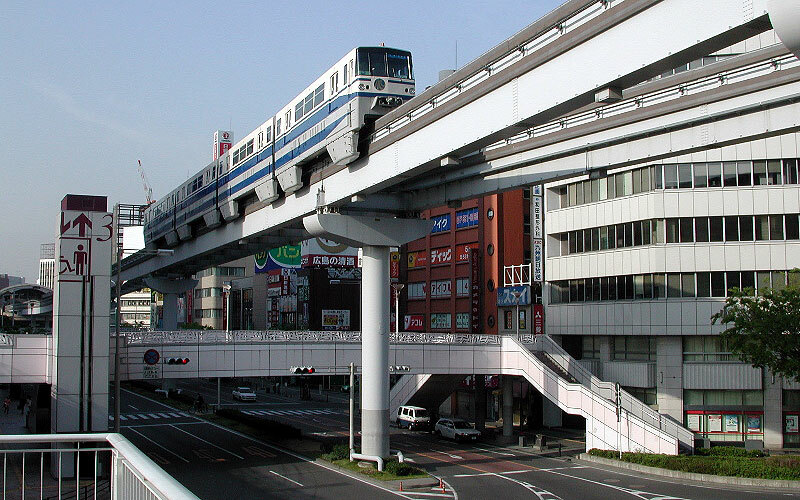 In 1985, Japan's second major urban straddle beam monorail opened, the Kitakyushu Monorail. Located on the island of Kyushu, the monorail was the first to employ Hitachi's flat floor technology. Floors were raised above the bogies, to allow complete passenger freedom of movement from car to car. 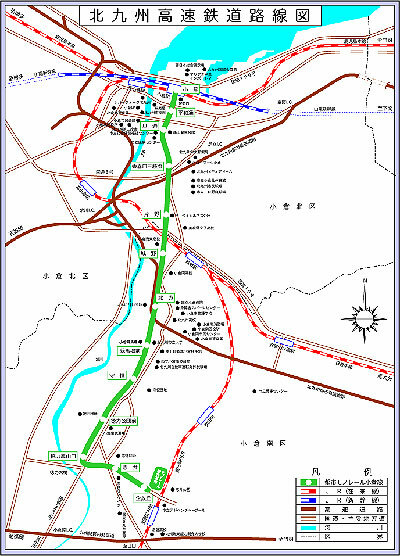 The 8.8 kilometer system runs from Kokura Rail Station in downtown Kitakyushu City to the residential neighborhoods in the southern part of the city (map courtesy of Kitakyushu Monorail). As we like to do with our photo essays, we'll follow the line from one end to the other. 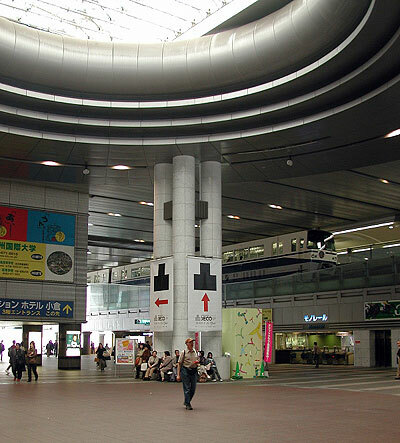 We start at Kokura Station, which is the newest station to be added to the Kitakyushu Monorail. Built inside a massive building that houses stores, a hotel, a bus station and is right next to Kokura's Shinkansen rail station (Bullet trains). In the center of this image, the fellow with the baseball cap is Ken Streit. Ken is an avid Monorail Society member that joined me, along with David M. Ice, on my 2003 tour of Japanese monorail systems. 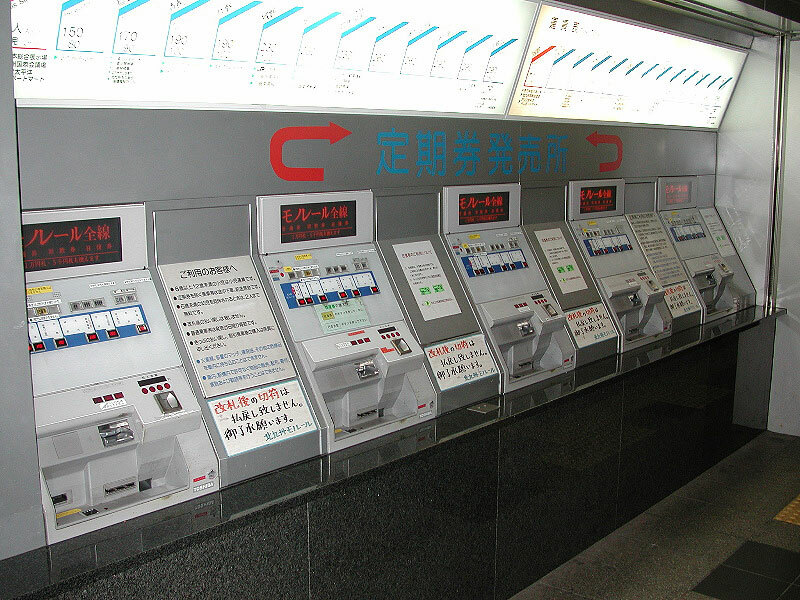 While this may look confusing to someone who can't read Japanese Kanji, we found it relatively simple to figure out how to buy tickets for our journeys. If you can't figure out what the green circles and red X mean, you probably shouldn't attempt a trip on your own to Japan. As you can see to the left, each station has a station attendant. Let's go to the trains a take a ride!